Playtest Night – Show our games some love! 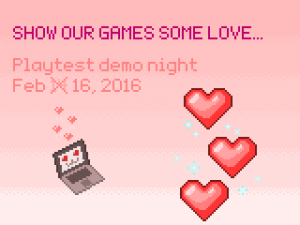 In honor of Valentine’s day, we’re going to show our games some love! On Tuesday February 16th at 6:30PM (Tentatively at Kosmos 1715 5th St NW, Albuquerque, NM 87102), bring your in-progress, playable games on aÂ computer, any monitors, controllers/peripherals, headphones or other equipment you need, and let’s get playing! Our goal here is to provide feedback for games in progress, so we can continue to improve and expand our projects. WeÂ wantÂ to setup stations all around our meeting location so everyone can get a chance to play all of the games. If you want some feedback, or want to see what everyone’s working on and give your input, come check it out!